Have you seen a toddler riding on a push buggy at the park and now you’re wondering what they’re all about? 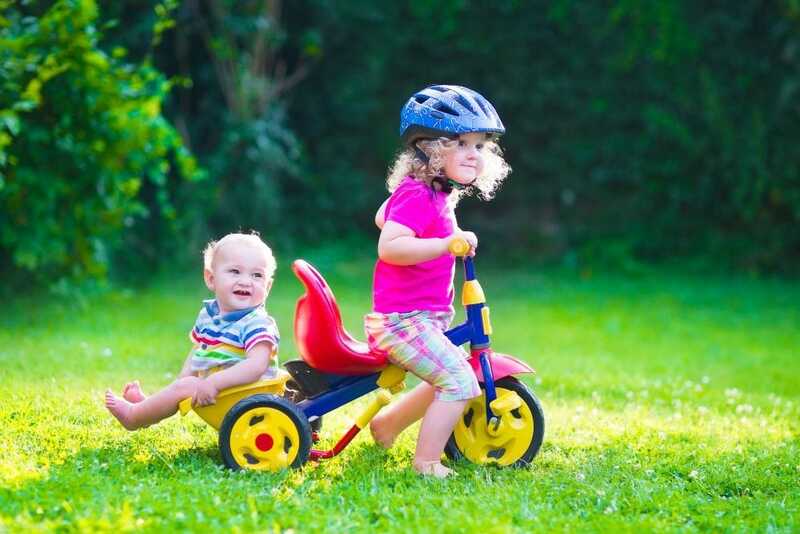 Maybe you’re wondering if your child is ready for a tricycle? The best ride-on toys for toddlers come in many different variations — how do you know which is right for your child? 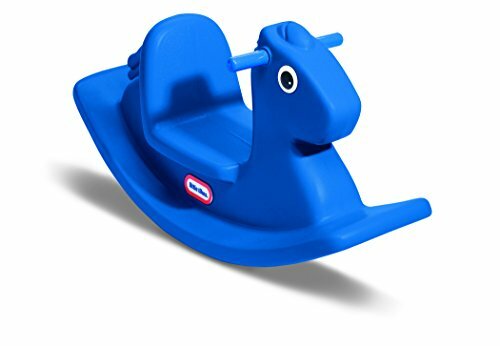 The ride-on toy has had a presence in every generation, from the earliest rocking horse to the latest scooter. It doesn’t take long for kids to want more independence, and ride-on toys can make them feel like the whole world is their own. That being said, there are a few things to consider before purchasing. We’ll provide some tips on buying the best ride-on toys and recommend a few of our favorite choices. Use the links above to check the latest prices or read our in-depth toddler ride on toy reviews below. Taking a walk: Some toddlers quickly tire of being stuck in a stroller. Many ride-on toys come with a handle that will allow you to push them like a stroller while giving them more of a view. Long days: If you’re going somewhere that requires your toddler to be on their feet all day, a ride-on toy can help. When not being used for seating, some can hold bags, coats or snacks. Rainy days: It can be difficult to help toddlers get their energy out when the weather is bad. Whether you have room for a ride-on train or just a stationary rocker, they can still provide a solution to cabin fever. The beauty of ride-on toys is that they can be used outdoors or indoors. And these toys can also give your child a chance to unleash their imagination (source). They can pretend they are in their own world riding their favorite unicorn or that they’re sitting in a fire truck on the way to save some lives. Ride-on toys are designed to meet a variety of heights, weights, and abilities. Some are battery powered and others are powered by your child’s leg strength. The variation means there is a good fit for almost every family. However, it also means you might want to have a few things in mind when you go to purchase one. 1. Pedals or No Pedals? Most of these toys move forward as your child pushes their feet across the floor. However, some ride-on toys also have pedals. This option is a great way to prepare your kids for bicycle training later on. When looking at toys with pedals, ensure your child is the proper height for that particular toy. You may want to bring your child to the store to make sure their feet are flat on the ground when sitting on the toy. If their feet don’t quite make it to the ground, it’s probably better to wait for them to grow a bit more before buying. If your child’s legs don’t reach the floor, they might not be able to control the toy fully, which can lead to accidents or injuries (source). Ride-on toys come in a wide variety of themes. You can find police cars, animal tricycles, and even construction equipment. If your child is particularly interested in a certain profession or activity, try to find a toy related to it. If you can, your toddler is more likely to continue using it. 3. Outdoor or Indoor Use? There are ride-on toys that work well for families who live downtown, or those for families who live in rural areas. If you are looking for one of these, you may want to think about the kind of ground it will be moving on. If the toy is going to be outdoors, it’s a good idea to find tougher tires, and materials that won’t rust outside. If it’s going to be used inside, you may want to consider the size of the toy and whether it will move well on carpet. If your child is ready for a ride-on toy, you have lots of great options to choose from. Whether you want something that’s functional or just fun, there’s a ride-on toy that works for you. 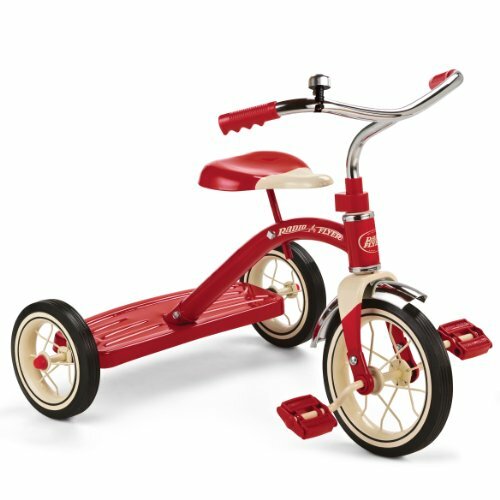 The Radio Flyer is a tricycle design untouched by time. It’s built for kids ages two to four, and the adjustable seat can be raised as your child gets older. The wide handlebars are easy for kids to grab, and they also make it more difficult for the tricycle to tip over. The back serves as a rear step, making it easier for your child to get on and off. The steel construction makes it extremely durable but should be covered on rainy days to avoid rust. With two color options, you’ll likely find one your child will love. 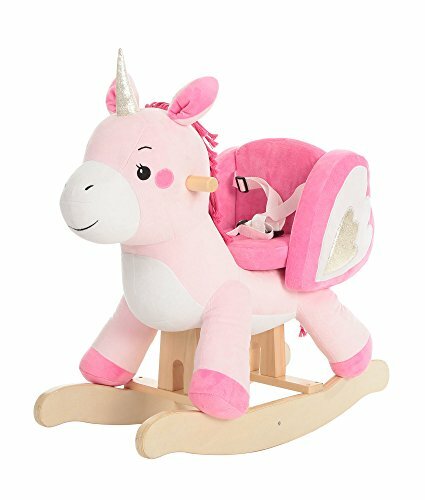 Designed with safety in mind, this unicorn-themed rocking horse is made for kids aged one to three years. The seat is surrounded by three sides, making it more difficult for young children with less balance to fall off. It also has a safety belt for extra security. The seat is made of a plush fabric that’s comfortable for your child, and it’s also stain resistant. The structure is made of solid wood — great for both carpet and hardwood floors. At a little over 13 pounds, this ride-on toy is sturdy. However, it is also a bit heavy for your child to move around by themselves without help. Scooters are a great ride-on toy option for people who have minimal storage space. The Kick Scooter is lightweight, and folds when not being used, making it easy to store under a bed or in a closet. Designed for ages two to eight, the scooter adapts to your child’s abilities by providing a removable seat for younger toddlers. They can sit, hold onto the handles, and push the scooter with their feet to move. As they get older, the seat adjusts to their height and can eventually be removed completely. 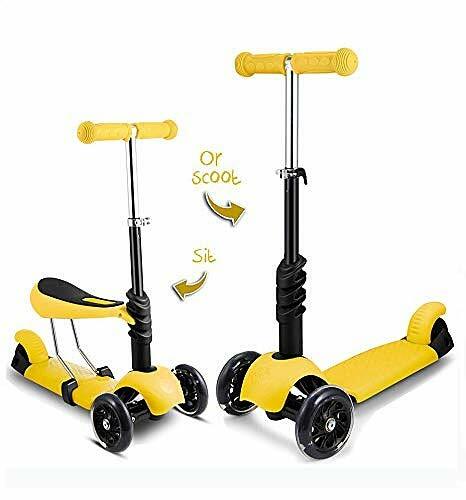 This sturdy scooter should give your child several years of use. For families who have extra space in the house or backyard, this 10-foot roller coaster ride-on toy is great fun. The track is easy to assemble by simply snapping the pieces together — no tools needed. It also includes two non-slip steps for your child to climb to the top of the track easily. The car is equipped with a high rail on the back, a handlebar, and a footrest, so your child can hold on tight. At the top of the track, the holding area is recessed so the car won’t move until your child is ready. If you don’t want to use the track, the car can be used as a ride-on toy by itself. This lightweight push bike by KIDZEUG is built like a motorcycle and comes in a variety of color options to choose from. The extra-wide wheels ensure that your child is stable and secure at all times. To move forward, they push off the ground with their feet. Made of plastic, it’s easy to clean and you don’t have to worry if it’s accidentally left out in the rain. 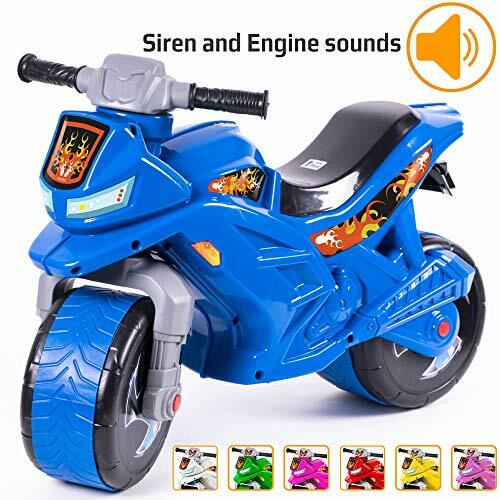 Most of the color options include siren and engine noises your kids can employ. This bike is designed for ages two to five and can hold up to 66 pounds. This ride-on toy is a battery-powered train. 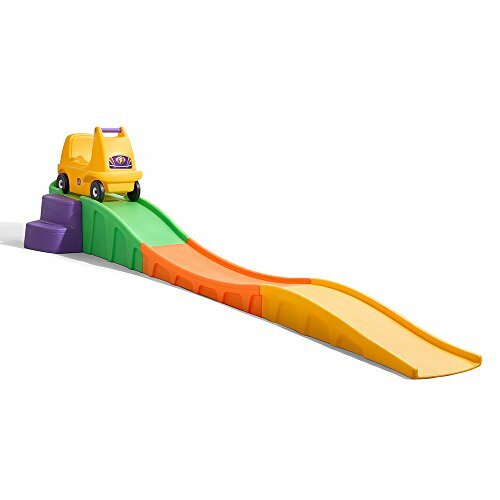 It comes with a track that will allow your child to ride around on a set route, but the toy can operate off the track as well. Shaped like the famous Thomas engine, your child sits on the seat and holds onto the handlebars. On the track, the train goes 1 mile per hour. Off the track, it can reach 2 mph. The battery is chargeable, so you don’t have to worry about being stuck without a replacement. It’s suitable for ages one to three, or up to 40 pounds. 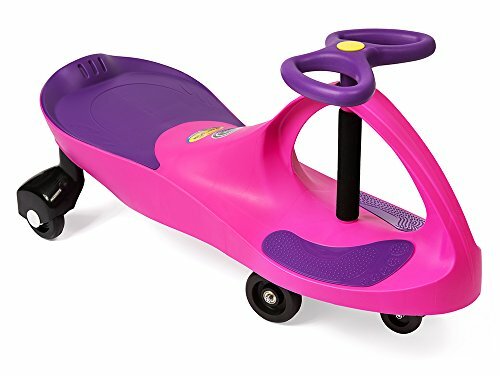 This ride-on toy has a unique design that eliminates the need for pedals or batteries. Half-tricycle, half-scooter — it moves forward using gravity and tension from the wheel system. As a result, it is designed for children ages three and up who are more likely to understand how it works. Available in six different colors, there’s a design every kid will like. The tires will work inside and outside and, when used correctly, can even be used in reverse. This is a toy that can travel with you to the park, or be used in the basement on a rainy day. Push cars are all the rage right now, and I can easily see why. They offer many of the same benefits of a stroller, especially if you live within walking distance of a park, restaurants, or shops. 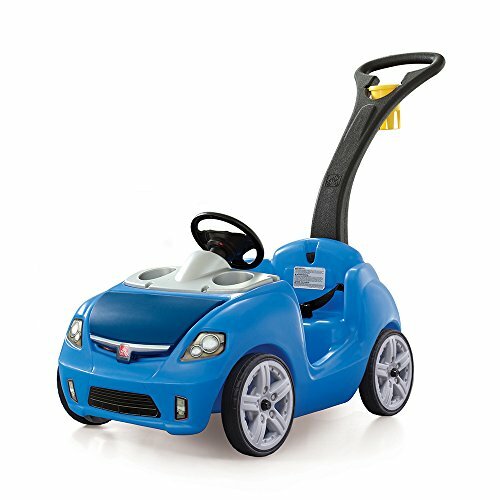 This push car comes in two color options, and also has two cup holders for your tot and storage space under the “hood.” The handle on the back, which allows you to steer the car, also has a cup holder for mom or dad. Once the child is sitting, they can buckle in for safety. They can also steer the wheel and honk the horn to feel more engaged in the ride. Compared to a stroller, your child will be able to see more and feel like a “big kid,” even though it’s suitable from 18 months. This super little rocker is designed for kids from 12 months old. The benefit of this rocker is that it can grow easily with your child, compared to rockers with safety straps that are more confined. This rocker will last until age three, with a maximum weight load of 50 pounds. To ride the toy, all your child has to do is sit in the seat and rock back and forth. The design of the rocker reduces the risk of them tipping backward or forward. Your child can go as fast as they please. If you have carpet, they can even scoot around the house on it. 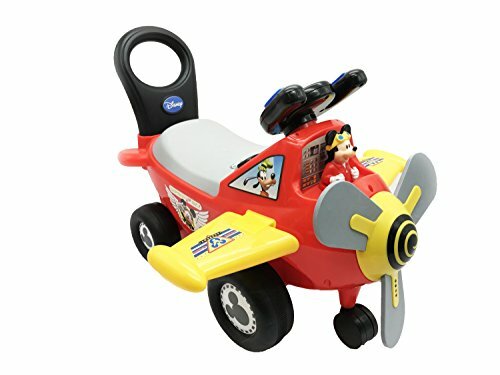 If your child is into Mickey Mouse and music, this airplane toy will be an exciting addition to their inventory. It’s designed for children ages 12 months to three years. For younger kids, a handle on the back can be used to guide them, or push them when they’re tired. Your child will be able to push buttons to play music, shift gears, and cause the propellers to light up and rotate. They use their feet to push off the ground and move the toy forward. Because the toy is made of plastic, it’s easy to keep clean. 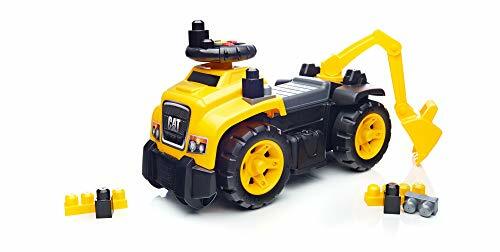 This ride-on caterpillar is a great way to introduce your child to the world of building and construction. It also has an excavator arm that will allow them to transport the included blocks during imaginary play. Designed for children aged 12 months to three years, this toy will help your child’s hand-eye coordination while giving them a fun source of exercise. The seat lifts to offer storage for the blocks they can use to load the excavator. 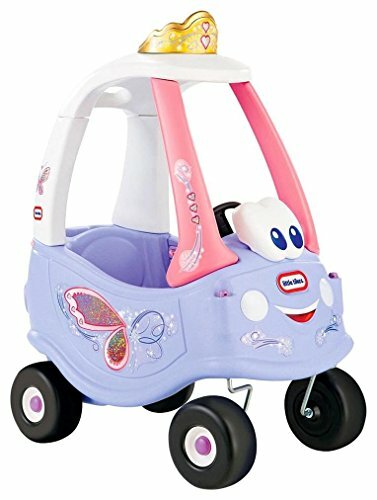 This cozy coupe car is designed for kids who love to feel independent. It’s made to adapt to your child’s growth, from 18 months to 5 years old, or up to 50 pounds. For younger children, you can keep the floorboard installed and push them from the back using a handle. As your child grows, remove the floorboard so they can push and steer themselves. The opening doors on either side give them easy access to the vehicle. The tires are durable enough to be used on most surfaces outside. For trips to the park or to the beach, it even has a small storage area in the back. 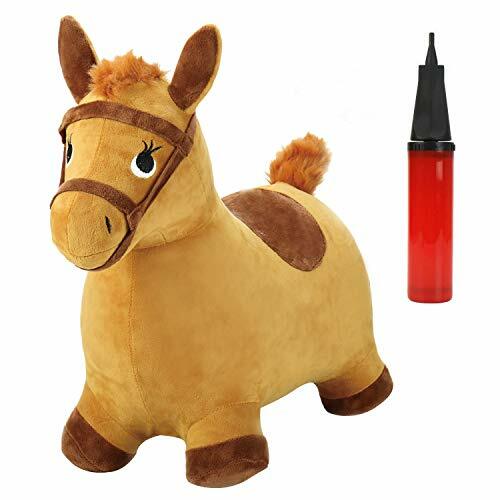 If your child loves animals, they will love this bouncing toddler ride-on horse. The toy inflates to become a four-legged hopper (hand pump included). Your child can bounce around the house or yard, with big ears to hang onto. The inflatable portion is made of high-quality, eco-friendly rubber and doesn’t contain phthalates. The seat height is 14 inches and it’s suitable for children from 2 years old. Some of my oldest memories from childhood involved my ride-on toy. I thought I was driving in my own world, and I now see that same joy in my children. My favorite ride-on toy is the Radio Flyer Classic Tricycle. Designed for smaller kids, it can help instill a passion for biking early on. Once they get the hang of it, your kids will want to bring it everywhere. There are so many kinds of ride-on toys out there. What are your child’s favorites? What challenges did you encounter after you picked one? Share your thoughts below, and please pass on this article to other parents you know.